Have you ever watched the gymnasts at the Olympics and wonder to yourself, “How do they do that?” Gymnasts practice for years to master their craft, however, they could not do what they do without first building incredible strength. Their strength-training workouts are so effective, that many gymnastics-based exercises are now being incorporated into Cross Fit and bodybuilding routines around the world. The following moves don’t require any equipment, but will still give you a full-body workout that will make you as strong as an Olympic gymnast. Let’s begin with the easiest exercise to get the heart rate up. The tuck jump is taught to beginner gymnasts, and is regularly used as they get progress. As a plyometrics exercise, a.k.a, jump training, it works the quadriceps, hamstrings, and glutes. This move will boost your jumping abilities, giving you strong, powerful legs while strengthening your circulatory system. You can increase speed so it can become more effective, but remember to execute properly, not just fast. You can also add cuff weights to make it more intense. If you are a beginner, I would start with no weights. You need to work up to that. Hollow Rock is an abdominal exercise that works to stabilize your core. It works the rectus abdominis and the obliques as well. Arms should be stretched out above your head; upper arms should be right next to your ears. 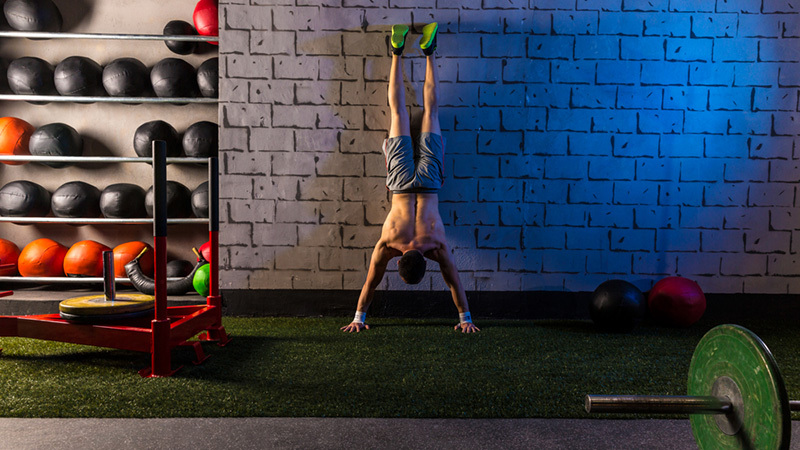 Handstand push-ups are an upper-body exercise, in which the shoulder and back muscles do most of the work, but staying balanced is also part of the challenge. A strong core is key here to help stabilize your body. If building strength is your goal, this is the exercise for you. Use your arms to lift yourself up and down. You want to be sure you have equal distribution of weight on head and hand, not all on head. All the weight on your head can cause you to crash down on your head. V-ups are a great abs exercise, working both the upper and lower abdominal muscles. They also works to help strengthen your back muscles and to tone your thighs. This one is a little difficult to do. You first want to begin with the modified v-up, which is one foot, and then alternate. After you master the one-footed version, you can go on to both feet. Once you master both feet, you will have very toned abdominal muscles, my friend. Lay Down flat with hands over your head. The Candlestick Jumps works not only your abs, but your back muscles and glutes, and they also increase your flexibility. Flexibility plays a huge part in gymnastics, but can be a very versatile asset across a range of fitness routines. Good flexibility improves your range of motion, reduces risk of injury, improves your mobility, and overall helps with performance. The l-sit is a very highly advanced exercise and typically used on gymnastics bars, but instead, I will teach you how to do it on the ground. This gymnastics exercise will strengthen your body without even moving. It works many muscles but will focus on your abs, arms (more so your triceps), and hip flexors. You want to begin easy and slow, which is why it is called a progression. This is a very challenging exercise that can take a while to master, but do not get discouraged. Follow the progressions and you will get there. GOAL: Hold for one minute- if you cannot hold for 1 minute, break it down. So, 10 seconds, then another 10 seconds. Until you reach your 1 minute goal. GOAL: Keep doing for 1 minute- Remember, if you can’t do it for one minute, break it down. Remember, that each exercise does require you to stretch and warm up before the workout. These six gymnastic bodyweight exercises combine for a total-body workout routine that’s great for building your strength and flexibility right at home. If you are a beginner, follow the modifications and progressions. You’ll be as strong and fit as a gymnast in no time.